On 20 July researchers at the MRC Centre for Regenerative Medicine announced that they had regrown damaged livers in mice. It’s just one example of scientists growing tiny versions of organs in animals and in the lab to study development and disease, and test potential treatments. Many of these organs also represent the first steps towards growing whole organs – or parts of organs – for transplant. MRC Science Writer Cara Steger rounds up progress. Why might you want to grow a tiny organ? Small organs, or parts of them, are useful for studying both development and disease, and for toxicity testing or testing new treatments. In some cases, mini organs will be able to replace research using animals. But they also offer a tantalising glimpse of a world in which we can grow complex solid organs for transplant. These tiny organs – often more like proto-organs with just some of an organ’s functions – are quite literally ‘starting small’, first seeing if it’s even possible. Here we list eight tiny organs that have been grown so far. 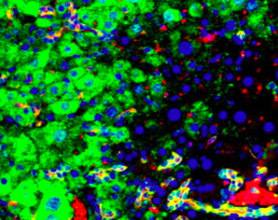 The MRC Centre for Regenerative Medicine researchers used liver stem cells, called hepatic progenitor cells, to regrow damaged livers in mice. After extracting the stem cells from healthy adult mice and maturing them in the lab, the researchers transplanted the cells into mice with liver failure. In a study at the Cincinnati Children’s Hospital Medical Center, researchers used induced pluripotent stem cells to grow human intestinal tissue in the lab. They then connected the tissue to the kidney of a mouse, providing it with a blood supply to allow it to mature into a piece of human intestine. This technique could provide a useful way of studying and ultimately treating gastrointestinal diseases in the future. Other work involving organoid intestines has been pioneered by EuroStemCell partner Hans Clevers. Miniature human hearts have been grown in the lab using a mouse heart ‘scaffold’. Researchers from the University of Pittsburgh removed all the cells from a mouse heart, leaving a skeleton-like structure, before reintroducing immature human heart cells. 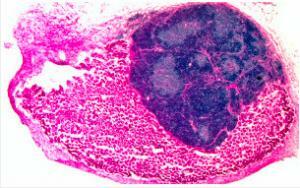 After just a few weeks the cells developed into beating heart tissue . 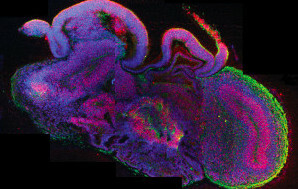 A team of scientists from the Institute of Molecular Biotechnology in Austria, in collaboration with scientists at the MRC Human Genetics Unit at the University of Edinburgh, has grown miniature brain-like ‘organoids’ with distinct brain regions, including a cerebral cortex and retina. It’s worth mentioning that while we’re talking about tiny organs, Prof Martin Birchall at University College London has successfully transplanted stem cell-based tracheas and larynxes into patients. Listen to him in the MRC Talks podcast from Winter 2014/15. This blog post orginally appeared in the Medical Research Council's blog insight on the 20 July 2015. It is reproduced here by kind permission.